(...) and from the airports with a private car, they were there waiting for us....so easy and trouble free! All our room accommodations were great, most had a washer and dryer which was a nice added bonus. All the thought and detail that you put into our trip was so greatly appreciated! Our last stop at Namale Resort in Savusavu, Fiji was the best place to take a breather before heading home....loved, loved, loved it!! Can't thank you enough for this amazing journey! The trip of a lifetime for us. All the arrangements worked out beautifully. The accommodations were excellent. All the transportation arrangements happened as expected and we were extremely pleased. Loved all the included tours and those that we chose to do on our own. One day at the Great Barrier Reef, the next at the Rainforest. We especially loved the city of Cairns. Truly one of the best trips we have ever done and About Australia made is SO easy!! Thank you Marissa! Sun-Kissed Beaches, Incredible Wildlife, Gorgeous Reefs and International Landmarks…. the Best of Australia in One Trip! When you dream about your next vacation, do you imagine relaxing on a long stretch of beach, the sound of waves crashing in the distance? Do you want to visit world-famous sites and iconic cities? How about exploring unique natural wonders and meeting animals you won’t find anywhere else? Start living the dream and experience the best of Australia with our Gold Coast, Great Barrier Reef & Sydney Vacation! You’ll land in Brisbane to begin your sun-kissed vacation on the Gold Coast, where curling waves and boundless beach days await. You’ll enjoy three nights in a spacious 4-star apartment-style hotel just one block away from the beach in Surfers Paradise. You’ll find plenty of sand to roll out a beach towel, pop up some shade, slow the pace and just chill. Ready to meet some exciting locals? If you choose to add-on our discounted Tours & Transfers package, the day after your arrival on the Gold Coast you’ll take a day trip to the Currumbin Wildlife Sanctuary, a heritage-listed zoological garden home to one of the world’s largest collections of native Australian wildlife! Getting up close and personal with wildlife has never been more intimate than this. Featuring over 1500 individual animals from over 200 species and entertaining, immersive shows, you’ll need a whole day to explore the sanctuary. Cuddle up with a koala for a photo opt – the only souvenir you’ll need! Marvel at the dozens of rainbow lorikeets as they rest on your shoulder. Meet an array of Australia’s reptiles. Feel the stunning white coat of Marrok, a pure white alpine dingo and star of the Sanctuary. 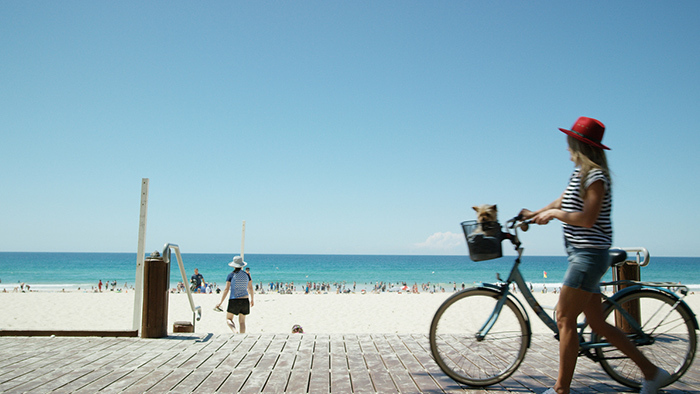 In your free-time, you’ll experience the quintessential Australian lifestyle of the Gold Coast. Kick off the day with a beachside yoga session or sunrise stroll, get salty with a morning surf, or head for the hills to cool off and browse exciting new menus in al fresco eateries. You may want to test your courage and venture up the SkyPoint Observation Deck for stunning panoramic views stretching across the Gold Coast skyline. Or get lost in the natural beauty of the fringing Goondawanna Rainforests on a tour through the Gold Coast hinterland. By night the vibrant entertainment scene welcomes the party-loving set, cocktails in hand, at the lounges, laid-back music venues and rooftop bars. From the Gold Coast you’ll head back to Brisbane for a short flight to Cairns. This stylish city is the gateway to Queensland’s tropical north, where rainforest meets the reef. Here you’ll spend four nights in a 4.5-star hotel located near popular Cairns attractions. The Cairns Casino, Esplanade Lagoon and Night Markets are all a short walk away. With our discounted Tours & Transfers add-on package, you’ll set off on an unforgettable Great Barrier Reef experience! You’ll cruise out to the Great Barrier Reef in a brand new luxury vessel. Enormous Maori Wrasse fish, pristine coral formations and unbelievable colors – it’ll be exactly as you see on postcards and pictures! Your cruise will set out to some of the best dive and snorkel sites on the Outer Great Barrier Reef, where the underwater wildlife and reef are thriving. Enjoy over four hours of snorkeling the otherworldly sights of this underwater wonderland – snorkeling equipment included. Replenish your energy with morning tea and a tropical buffet lunch of filling meats, salads and fresh fruit with complimentary coffee and chilled water. Upgrade with optional SCUBA dives and meet more underwater locals – see clown fish, turtles and discover spectacular coral formations. A little worried about dipping into the water? You can choose to experience the reef in your own style and see the reef from a glass bottom boat or semi-submersible for a small additional fee. Your next day in Cairns is free to explore this tropical paradise and its rich historical culture. You won’t want to miss the verdant Daintree Rainforest, the oldest rainforest in the world – even older than the Amazon! Join an exclusive tour led by an Aboriginal guide of the Kuku Yalanji people, indigenous to this rainforest region, and learn how to hunt for fish, mud crabs and mussels. Or you may want to take it slow and unwind with a cocktail at a waterfront bar and a platter teeming with freshly-caught local seafood. After relaxing in the tropics you’ll head to Sydney, where a blend of urban city life and sunny coastal splendor awaits. You’ll stay two nights in a stylish and comfortable accommodation conveniently located between Darling Harbour and the Sydney central business district. With our discounted Tours & Transfers add-on, you’ll get to see the famous Sydney Opera House up close with a tour behind the scenes of this architectural masterpiece. After your tour you may want to explore the popular nearby sights. Get your hands on a Sydney Harbour Cruise Pass for a hop on hop off cruise along the harbor and stop at sites such as Manly Beach, Taronga Zoo, Luna Park, Circular Quay and much more. Stretch your legs on the Bondi to Coogee Coastal Walk, running along some of Sydney’s best beaches and coastline. Grab a bite to eat at one of many waterfront eateries and fine dining institutions. One of our favorites is Graze, located in the Museum of Contemporary Art Australia with unbeatable views of the Sydney Opera House. Take in panoramic views of the city on top of the Sydney Harbour Bridge with an exhilarating bridge climb! As the sun sets on your final day in Sydney, you’ll look back on your vacation filled with fun in the sun, incredible wildlife and essential Australian experiences with a smile on your face. The memories you’ve made of your Gold Coast, Great Barrier Reef & Sydney vacation will make for incredible stories everyone will want to hear – and it all went without a hitch! As your experts in Australian travel, leave the planning to us and enjoy the vacation of a lifetime! All prices are in US dollars and correct as of April 17, 2019. Pricing is from “per person” based on Double Occupancy (2 Adults) in hotels. Single Supplements apply. Upgrades available on request (upgrade supplements apply). No refunds allowed. Changes are permitted (fees may apply). Other restrictions may apply. Not combinable with any other offer or discounted vacation package. About Australia reserves the right to adjust the amount of any outstanding balances at any time according to USA Exchange Rate variations. All taxes, GST & Fuel Levies are included in the Price unless specified otherwise. Prices may vary when you book your travel package and are not guaranteed until payment in full is received. Airlines, hotels and tour operators frequently change their prices as a result of rate increases, fuel surcharges, government imposed taxes or fees. Prices may increase prior to full payment for those and/or other reasons. All prices, itineraries and routings are subject to change. After full payment, prices are guaranteed except only due to an increase in government imposed taxes or fees. By paying your deposit, you understand and agree to the possibility of such increases. Flights, where included, will be operated by Qantas, Virgin Australia or their code-share partners; flight Taxes & Fuel levy included; Economy Flight Class of Service. Upgrades are available (additional price). Flights maybe based on Fares which can not be held in advance of purchase, same day ticketing may be required. Blackout dates and seasonal supplements will apply; these vary by travel vendor and are subject to change. Travel may be permitted outside the dates listed, but may attract seasonality or special event surcharges. Hotel selection is subject to change. Sydney: Travel in Sydney during the following dates may result in increased rates and/or hotel substitutions due to deal blackouts and seasonality: May 22 – 28, 30, June 27 – July 11, 18, August 11, 18, September 29-30, 17-28, December 29, 2019 – January 1 & February 3 – 10, 2020. Currumbin Sanctuary: Price includes return transfers from your hotel and a koala cuddle with photo. 1 – A Tree photo. Meet and greet your koala. Koala will safely sit in fork of tree prop and guest can stand next to koala and stroke its back for a professional photo. 2 – Professional family/group photo. Meet and greet your koala. A suitable member of the family/group can hold the koala whilst other guest/s can stand next to koala stroke its back for a professional photo. Does not operate on Christmas (December 25th) or ANZAC Day (April 25th). Great Barrier Reef Tour: Price does not include transfers, but Marlin Jetty is a very short walk from your hotel. Transfers can be added on request (additional cost). Departure subject to weather conditions. Does not operate on Christmas. This tour will require about $20AUD EMC, Port Authority & fuel levy per person per day to be paid at Check-in. Opera House Tour: Price does not include transfers. Tour is not available April 19, August 31, September 1, December 25, 31, 2019 & January 2,2020. As the Sydney Opera House is a working performing arts centre, additional block out dates may be added at the Opera House’s discretion.